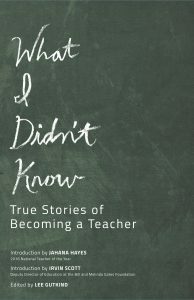 I’m proud and pleased to announce that one of my essays is coming out this fall in the collection “What I Didn’t Know: True Stories of Becoming a Teacher” (In Fact Books 2016). My essay is about the crazy learning process that was opening an international high school in China, and all the m isunderstanding, culture clash, and ultimate success that went along with it. It was nuts, let me tell you. Someone almost gets hit with a baseball bat in the first paragraph. I’ll be reading from the essay alongside other authors from the anthology at Seattle’s wonderful Hugo House on October 11. If you’re a writer or educator in the Seattle-Tacoma area, it will be an evening of sharing stories and talking candidly about the challenges and rewards of teaching at every level. Come join us! Classroom cover photo by Victor via Flickr Creative Commons.